* Schedules subject to change. For event bookings and other inquiries, email contact(at)touringkitty(dot)com. Ateneo Chamber Singers doing back up vocals. We’re back for a one-night only show to begin 2019! Watch the ABS-CBN Philharmonic Orchestra and the Ateneo Chamber Singers on December 15, 2018, Saturday, 7pm at the Shangrila Plaza Mall for a FREE Christmas Concert. Catch our show this weekend! Click poster for details. Susan Waters Masterclass and Recital. August 14-17, 2018. Stories in Songs. First ever solo concert. Vigan CTC Auditorium June 2017. 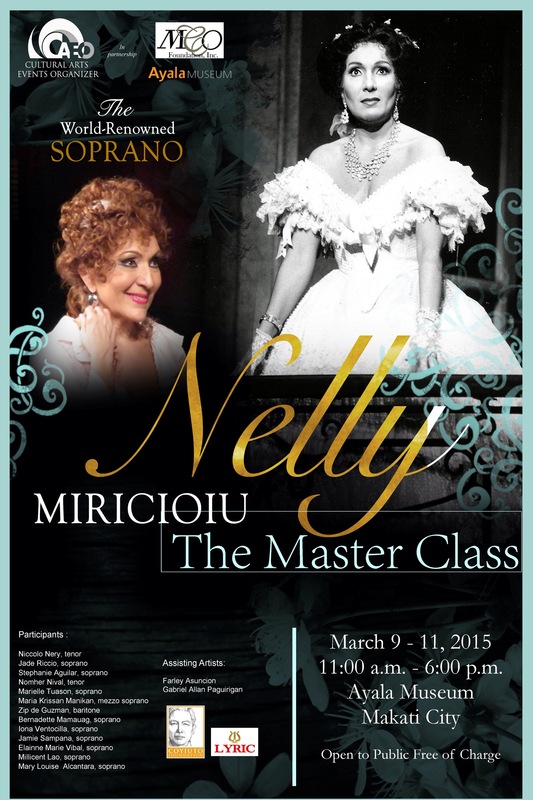 Nelly Miricioiu is an acclaimed soprano and will be giving a concert on March 6 at Meralco Theater and Masterclasses to singers on March 9-11. This will culminate with a concert on March 14 and 21. I am one of the fortunate singers who passed the video auditions last year and this masterclass is a scholarship for us, thanks to the generous sponsors. * My show as First Wood Sprite is on September 11 at CCP and September 23 at UP. Please call 9296963 for tickets. Click photo to visit the production’s Facebook Page. Click on the photo for related blogpost. Click image to register for event.